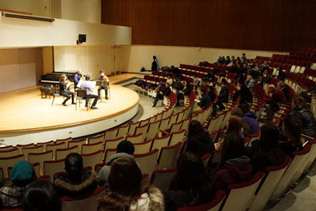 Pianist Nancy Sicsic teaches courses in the Alexander Technique and piano as a member of the Graduate Music Faculty at the University of Toronto. She is a certified Alexander teacher and one of just a handful of performing pianists in the world qualified to teach the Technique, which helps people and musicians in particular to maximize their potential by eradicating unnecessary effort and tension patterns. Ms. Sicsic’s career spans twenty five years of teaching music and piano in the United States and Canada in almost every kind of academic setting. She designed and taught piano pedagogy courses at Rice University and at Frostburg State University in Maryland and is now extremely active as a studio teacher and promoter of health and wellness for musicians. Nancy received her degree in the honors program at Rice University in Houston, Texas, where she studied piano performance with master teacher John Perry and organ with Clyde Holloway. Ms. Sicsic performs in the U.S. and Canada as soloist, chamber musician, and as part of a duo piano team with her husband Henri-Paul Sicsic. She is in demand as a pianist, a collaborative artist, an organist and as a dynamic clinician who gives workshops on piano teaching and the Alexander Technique. A graduate of the Vancouver School of the Alexander Technique, Ms. Sicsic is on the executive council of CANSTAT, Canada’s Society of Teachers of the Alexander Technique. Nancy Sicsic is also a member of the Faculty at the Kingsway Conservatory of Music in Etobicoke, Ontario, and she is Assistant Organist at St. Basil’s Catholic Church, the collegiate church of the University of St Michael’s College in the University of Toronto.